Women in the U.S. tech industry have long faced major disparities in both employment and pay. Last year, SmartAsset’s analysis of Census Bureau data found that women hold less than 26% of tech jobs in the U.S. and on average earn just 85% of what men in those positions earn. We further found that in many top tech cities, the numbers are worse. In San Francisco, for example, just 21% of tech workers were women. Read the 2017 version of this annual study. Our 2016 analysis reflects no significant progress in either employment or pay for women in tech. In San Francisco, the tech workforce remains more than 75% male. Other major tech hubs like San Jose and Seattle have similar ratios. Twitter: women hold 13% of technical positions. Amazon: women hold 11% of technical positions. Google: women hold 18% of technical positions. Apple: women hold 22% of technical positions. Facebook: women hold 16% of technical positions. Those numbers may be discouraging, but in a number of U.S. cities the tech workforce is not nearly so imbalanced. In fact, a handful of cities have realized pay equity between men and women in tech and in two cities the percentage of women in the tech workforce has edged over 40%. Trending down. Across the nation, the ratio of women in computer and mathematical occupations fell from 27.1% in 2011 to 26.5% in 2014. While the number of jobs held by women increased by about 50,000 over that time, the number of jobs held by men increased by 223,000. Better representation goes with better pay. There is a significant positive correlation (49%) between tech industry representation for women and pay equity in the 58 cities SmartAsset analyzed. While it is impossible to say what exactly causes this relationship, it is clear that some cities have a better overall culture for women in technology. Women as a percentage of the tech workforce. Gender pay gap in tech. Four-year tech employment growth. This statistic includes tech jobs for both men and women. We ranked each of the 58 cities in our analysis according to these four metrics (the full list of cities and data for each metric is at the end of the article). We then averaged those rankings, giving half weight to tech employment growth and full weight to the other three metrics. Lastly, we calculated an index score based on those averages. A city ranked first in each category would score a perfect 100, while a city ranked last in each category would score a zero. A score that is closer to 100 reflects a better tech employment environment for women. Data used in our analysis comes from the U.S. Census Bureau American Communities Survey for 2014 the most recent year for which data is available. Four-year comparison data comes from the 2011 survey. Wondering about your tax liability? Try SmartAsset’s income tax calculator. The numbers speak for themselves. In the U.S. capital, women hold 40.4% of computer and mathematical occupations, as compared with a national average of 26%. Meanwhile, pay for women in those occupations is statistically equivalent to the pay for men. 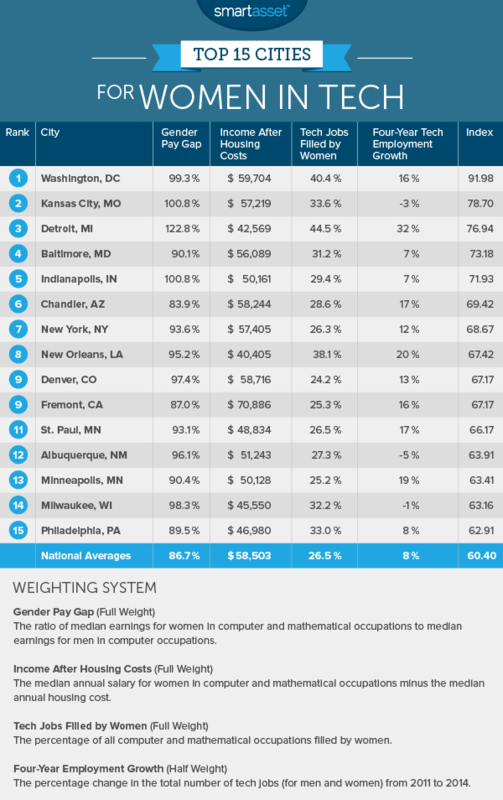 There is no gender pay gap in D.C. The District’s tech industry is bolstered by the presence of the federal government, which employs significant numbers of tech workers and which often prioritizes the types of fair employment practices that can lead to greater workplace diversity. This is the second year in a row that Kansas City has ranked as the second-best city for women in technology. The city’s tech community continues to stand out for both pay equity and for the makeup of its tech workforce. Median pay for women in KC’s computer and mathematical occupations is $67,587, which is about $500 more than the median pay for men. The Motor City ranks first for three of the four metrics considered in SmartAsset’s analysis.2 Its four-year tech employment growth, percentage of women holding tech jobs and pay ratio are all tops in the country. This is also reflected at what is perhaps Detroit’s leading tech employer. Quicken Loans, which has its headquarters in downtown Detroit, routinely rates among the best U.S. companies for both diversity and overall company culture. Women fill 45% of all jobs at Quicken and 43% of management jobs (the company does not report tech jobs separately). Based on those statistics alone, Detroit would rank as the best city for women in tech, but it lags in one other important metric: overall pay. Even when taking into account the low cost of housing in Detroit, the level of pay for women in the city’s tech industry ranks as 12th lowest among the 58 cities in SmartAsset’s analysis. Women hold 31.2% of computer and mathematical positions in Baltimore. While that is a far-from-ideal ratio, it ranks eighth among the 58 cities in SmartAsset’s analysis. It is also well above the national average of 26.5%. That, together with a below average gender pay gap in Baltimore, makes it one of the country’s top cities for women in tech. The capital of Indiana is one of just three U.S. cities in which earnings for women in technology jobs is equal to or higher than men in those same jobs. According to the U.S. Census Bureau, the median pay for women in computer and mathematical occupations in Indianapolis is $60,181. The median pay for men in those occupations is $59,713. Chandler is home to the offices of a number of major tech companies, including Intel and PayPal, which is owned by Ebay. These companies employ 11,300 and 2,000 people in the Chandler, respectively. Like many other major Bay Area-based tech companies, in recent years both Intel and Ebay have promised a greater commitment to workforce diversity. Chandler, which has more gender diversity in its tech workforce than San Jose, may be a good place to work toward those goals. There are more than 20,000 women working in tech jobs in New York City, more than the next two largest tech cities combined. New York is also home to numerous technology companies that were founded by women. These include The Muse, a career resource site, and LearnVest, which provides financial planning services and was acquired by Northwestern Mutual in 2015. New Orleans has established itself as a leader in tech diversity. Organizations such as New Orleans Women in Tech have worked to foster a more inclusive culture for women in the technology industry, which is reflected in the data on workforce demographics. Women hold 38.1% of computer and mathematical occupations in New Orleans, the third-highest ratio of any city in SmartAsset’s study. The tech industry culture in New Orleans also played a role in bringing the Collision Conference to the city for 2016.The conference drew more than 7,500 attendees when it was held in Las Vegas last year and this year it is placing a special emphasis on women in technology. It is scheduled for April 26-28 at the New Orleans Morial Convention Center. While the Mile High City lags behind the rest of the U.S. in the makeup of its workforce (women hold 24.2% of computer and mathematical occupations in Denver) it rates among the top U.S. cities for pay equity. Women in Denver earn a median income of $72,012 while men earn $73,908. That is sixth smallest percentage gap of the 58 cities in SmartAsset’s analysis. Located at the south end of the San Francisco Bay, Fremont is the only Bay Area city to rank among the top 15 cities for women in tech. After factoring in housing costs, women who work in a tech job in Fremont (and also live there) have a higher average income than those in San Francisco and Oakland. The average income after housing costs for women in Fremont’s tech industry is $70,886, second highest of the 58 cities in SmartAsset’s analysis. (San Jose ranks first for that metric but lags behind Fremont on several others.) As one of America’s safest cities, Fremont may also be a great place for women in tech who are planning to raise a family. Both of Minnesota’s Twin Cities rank among the 15 best U.S. cities for women in technology. St. Paul has a slightly lower gender pay gap than Minneapolis (7% vs. 10%). Women also constitute a slightly larger percentage of the tech workforce in St. Paul than in Minneapolis (26.5% vs. 25.2%). Moving to Minnesota? Try SmartAsset’s Minnesota tax calculator. Tech employers aren’t just software companies or internet startups. In fact, a significant percentage of tech jobs have nothing to do with personal computers (or tablets or cell phones). Some of Albuquerque’s largest tech employers are in fields like aerospace and solar energy. For women with a technical background in one of those fields, Albuquerque may be a good place to build a career. The gender pay gap in the city’s tech workforce is just 4%, the fifth-smallest gap in the U.S.
Minneapolis is one of the nation’s most well-educated cities. That gives it (and the entire Twin Cities region) an edge in drawing companies who need workers with a background in computer science and computer programming. The number of tech jobs in Minneapolis grew by 19% from 2011 to 2014, the ninth-highest increase in the country. Milwaukee rates among the top 10 U.S. cities for both it’s gender pay gap (which is less than 2%) and its employment ratio. Women hold 32.2% of computer and mathematical occupations in Milwaukee. The national average is just 26.5%. Philadelphia is among the cities that is leading the way for greater diversity in tech all across the country. It is home to the nonprofit organization TechGirlz, which is dedicated to eliminating the tech industry gender gap. That gap in Philly is smaller than elsewhere in the U.S., with women holding 33% of computer and mathematical occupations. That’s the sixth-highest ratio of any city in SmartAsset’s study. Whether or not you’re a woman in tech, you need to start thinking about your retirement. Here’s how much you should be contributing to your 401(k). It’s easier to benchmark your goals if you know how much you need to save in order to retire comfortably. SmartAsset’s retirement calculator can help you figure out how much you should be saving each month based on y our estimated annual retirement expenses. 1. Because of budget cuts, the U.S. Census Bureau no longer publishes its most detailed tables of employment and income by occupation in U.S. cities. Thus, while last year’s analysis looked specifically at “computer occupations,” this year’s analysis considers the broader “computer and mathematical occupations” category. Computer occupations – tech jobs – constitute the vast majority of the category, 94% based on last year’s data. There is also greater gender equality in mathematical occupations, which means the data used in this year’s analysis paints a rosier picture of the tech industry’s gender dynamics. 2. Detroit was not included in SmartAsset’s 2015 analysis because of the size of its tech workforce. Strong job growth meant it was large enough to be included in this year’s study. As we described in a footnote, if it had been included in 2015 it would have ranked fourth.